We had the MOST fabulous time on the Caribbean cruise this month, I sure hope you can join me on a future trip! Watch my blog for more photos of the trip. Since I've been back I've been receiving new merchandise. So this note is about new things in the store. In about a week I'll send out another note on the next Farmer's Market block and Book Club block, so stay tuned! And if you are not on my email newsletter list, click "JOIN" to the left and sign up. My newest line of fabric is a fresh clear updated 'me'. Nikki has lovely soft greens, yellow, blues with a deep splash of plum and a sparkle of orange. The collection has 26 pieces so head over to the fabric page to pick some up! Just before I left for the cruise I designed this little table runner and have enough fabric for a few exclusive kits... hope you are in time to grab one from the KIT PAGE! 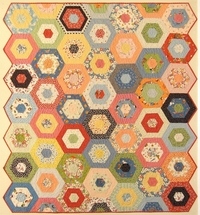 I thought it would be WAY FUN to add some quick pieced patterns I have found out there. Two of the newest additions are the Happy Hour book and Merry Go Round. 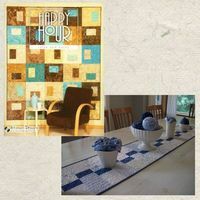 I am having a friend make up a few of the Happy Hour table runners in Nikki to show you. 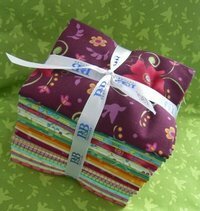 And the Merry Go Round quilt is constantly, yes constantly calling my name from the shelf!! I think it offered to buy me cupcakes the other day... really it did! 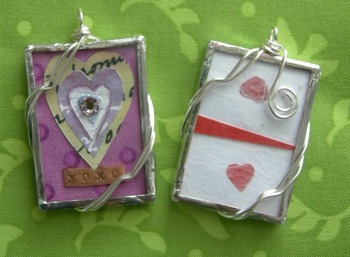 The newest custom charm is a heart... oh-la-la! The background is Nikki fabric with bits of paper, glitter, etched metal and sparkle to top it off! I only commissioned a few, pick it up here at the MUST HAVE page. Front and back view.